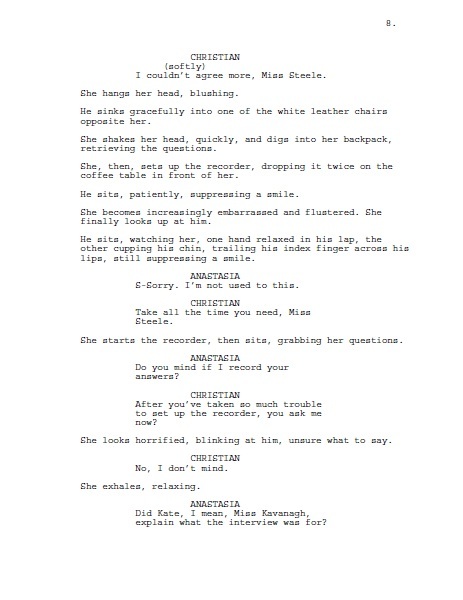 This is not the actual screenplay, of course, but it is very similar to what the actual screenplay might look like. Chad from @50ShadesCasting is an aspiring screen writer. He created this screenplay based on chapter one of the book. He has generously allowed us to share it with you. Please send Chad a tweet to thank him for sharing his hard work with us. We will post the update alert for tomorrow's installment on our Sulia Channel so please make sure you are following us over there. Also, follow us on Twitter @FiftyShadesFilm and Like us on Facebook for all Fifty Shades of Grey breaking news and information.